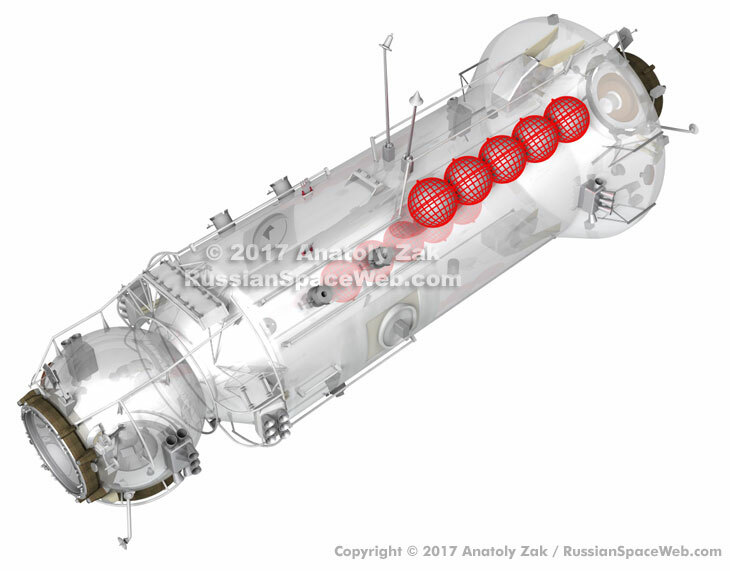 In March 2017, Russia's MLM Nauka module hit another serious snag on the way to the launch in 2018 to the International Space Station. Engineers discovered another contamination issue, this time in the propellant tanks of the long-delayed module. A big part of the year was spent on attempt to fix the tanks, while the launch of the module had to be delayed until the end of 2018 at the earliest. The design of the MLM module as of 2016. As of January 2017, the flight manifest for the International Space Station, ISS, called for the launch of the MLM module on December 6 of the same year, followed by its docking at the outpost on Dec. 15, 2017. To free the nadir (Earth-facing) docking port on the Zvezda Service Module, SM, for the new arrival, the Progress MS-06 cargo ship was to undock from the Russian segment, carrying along with it the Pirs Docking Compartment, SO1, which has occupied that location since 2001. The Pirs module would then be deorbited and burn up in the Earth's atmosphere over the Pacific Ocean along with Progress MS-06. Following the integration of the MLM module, on Jan. 23, 2018, the Soyuz MS-06 transport spacecraft was to undock from the zenith (sky-facing) port of the MIM2 Poisk module, make a quick fly around of the ISS and re-dock at the nadir port of the MLM, becoming the first spacecraft parking at the new module. To integrate the newly arrived MLM module into the Russian segment, Roskosmos promised to bump the Russian crew onboard the ISS back to three people beginning in March 2018. The cosmonauts were scheduled to conduct multiple spacewalks on the exterior of the MLM module, integrating its systems into the Russian segment. A total of 11 spacewalks were planned to accommodate the module: including four ahead of its arrival and seven more after its docking. By the end of January 2017, it became clear that the December 2017 launch date for the MLM module could not be sustained. The updated processing schedule to be issued by GKNPTs Khrunichev on January 27, was expected to push the launch to June 2018. However, as of mid-February, the status of the processing remained in limbo. As it transpired, specialists were unable to clean the module's propellant tanks of the contaminants that had also plagued the MLM's propellant lines and valves. Since 2013, engineers at RKK Energia and GKNPTs Khrunichev in Moscow have labored on replacing a jungle of pipelines, valves and thrusters, comprising Nauka’s sophisticated propulsion system, which got contaminated with metallic saw dust during the botched upgrades of the module. The MLM spacecraft carries a total of six 400-liter cylindrical tanks designated 77KM-6127-0. Two of them are used to store high-pressure gas and four others contain fuel and oxidizer under low pressure with a total mass of 2,432 kilograms. This amount is enough for the MLM to make it to the ISS after separation from the third stage of the Proton launch vehicle. The repair team had hoped to wash contaminants from the tanks, but it had recently been determined that all efforts to cleanse the vessels had failed. To make matters worse, these tanks had been built decades ago and their key components were no longer in production, in particular, the pipes used for manufacturing the tanks' stringers and the metallic tape used to build sections of their internal bellows. GKNPTs Khrunichev estimated that the revival of the tanks' production would require 240 new items of manufacturing hardware and around 50 thousand work hours. The cylindrical tanks are strapped around the module's exterior like bullets in a revolver drum. Because of their unique design, they fit neatly onto the module, leaving enough room to place radiator panels over them. But it also means that no modern tanks can get in their place without cutting through the radiators! Fortunately, there was a second set of shorter tanks, which was removed from the module (previously called FGB-2) during its conversion from its original role as a backup to the Zarya FGB, the very first piece of the ISS. 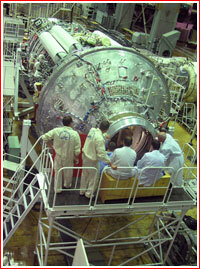 To make room on the exterior of the converted FGB-2/MLM module for the attachment of a European-built robotic arm and various scientific instruments, the extra set of shorter tanks was removed. 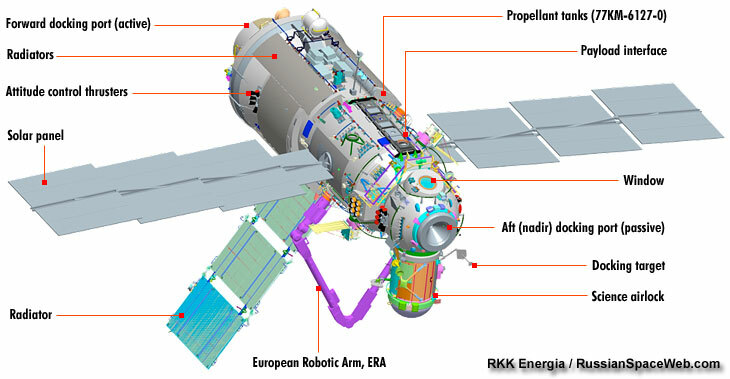 By March 16, experts at RKK Energia evaluated several options for replacing the contaminated tanks on the MLM module. First they looked whether they could install brand-new tanks developed for the new-generation Science and Power Module, NEM. A pair of such vessels could be installed on the MLM to accommodate 880 kilograms of propellant. However, due to their size, the tanks would cut through the radiators and even protrude into the payload fairing of the Proton rocket, protecting the MLM spacecraft during ascent through the atmosphere. Even if the radiators and the fairing were modified, the module would still be lacking 1,291 kilogram of propellant required for its planned mission and contingency situations. Obviously, it was tempting for RKK Energia to consider fitting MLM with standard 210-liter refueling tanks from the Progress cargo ship. 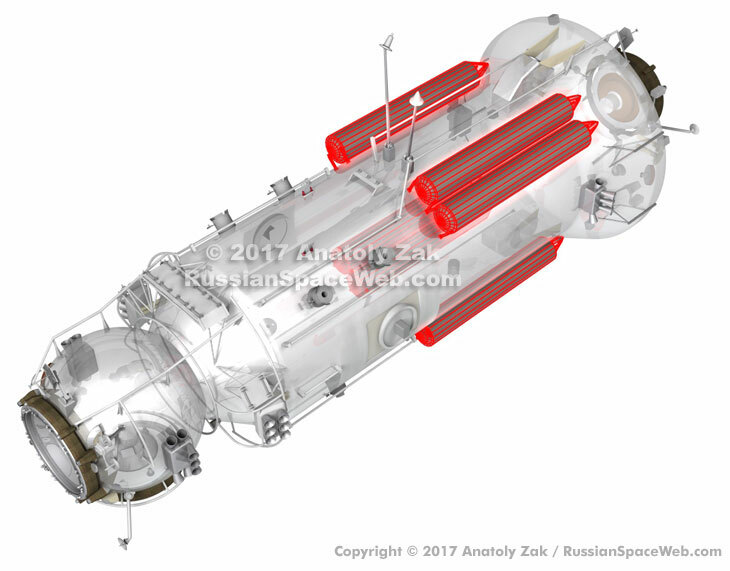 It would be feasible to install 10 such tanks into the MLM module in two groups of five accommodating a total propellant supply of 2,352 kilograms. It would be enough for the nominal mission, but, again, it would be also necessary to cut through radiators and Proton's fairing to accommodate them. Engineers then considered using six short tanks, identical to those used for refueling of the ISS on the Zarya FGB module. Six refueling tanks were removed from the former FGB-2 module, during its reconfiguration into the MLM to make room for attachment points of various payloads, instruments and a European robotic arm. If they were put in place of the contaminated long tanks, the short refueling tanks could hold 2,094 kilograms of propellant, just enough to fly MLM's nominal mission sans the orbital insertion maneuver after the separation from the Proton. Alternatively, the module could conduct the orbital insertion maneuver but would then have no propellant left for a contingency rendezvous maneuver in case of a failure of the original rendezvous attempt. The best option was found to be to combine four (short) refueling tanks and a pair of longer (main) tanks which were left over from the FGB-2 project. Four short tanks would take 1,396 kilograms of propellant and two long tanks would take 808 kilograms. It will bring the fuel cache onboard the MLM to 2,204 kilograms, which would be enough to fly MLM's nominal mission. Most importantly, no changes would be required on the nearby radiators or on the rocket's payload fairing. All things considered, the remaining extra tanks from the FGB-2 project could have provided a lifeline for the beleaguered MLM module. That’s is, of course, if they were not plagued with the same contamination problem, which was a million-dollar question. To find out, investigators conducted vacuuming of the four propellant tanks: BNDO-1, BNDG-3, BVDO, BVDG. A special filter was used to trap particles ejected from the interior surfaces of the tanks' bellows where propellant would be stored during the flight. The subsequent visual inspection of the filter revealed countless shiny metallic particles in all four tanks. Ranging in size from 750 to 1,300 micro-meters, the contaminants were large enough to be visible to the naked eye. As a result, by March 28, all the available tanks were officially disqualified for installation on the MLM module. According to industry sources, some officials apparently wondered whether it would be possible to avoid cleansing the tanks and instead to rely on filters in the propulsion system designed to weed out occasional contaminants. However propulsion experts warned that massive clogging of the filters could unpredictably change the carefully balanced ratio between liquid fuel and oxidizer entering the engine. Even worse, the particles could get into the sensitive electric valves of the system and cause them to leak propellant or prevent those valves from cutting off the propellant flow when necessary. These particles could also cause leaks in the pressurization system, in turn leading to undesirable pressure increases in the propulsion system. Although there were backup valves in the network to prevent exactly such a scenario, had the backup valves been breached as well, then all the pressurization gas would have escaped. Finally, the damage to valves controlling the re-fueling operations could cause leaks during the transfer of propellant from the Progress cargo ships into the tanks of the MLM module. 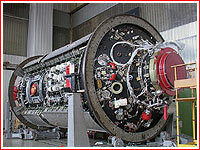 By March 30, the KB Khimmash propulsion development center certified that the 11D442 main engine for the TKS spacecraft and the MLM Nauka module had never been tested to work with contaminated propellant. As a result, on April 1, the MLM project managers made a decision to default back to the use of six original tanks, which would have to be opened up in order to be cleaned and then restored. The cylindrical metal vessel of each tank was expected to be cut open along its longitudinal axis to give engineers the access to its flexible bellows inside. Resembling a harmonica, the bellows are used to force the propellant toward the engines with pressurized gas supplied on its opposite side. The most difficult part of the job would be a thorough cleaning of all the crevices in the internal cavity of the bellows. The MLM repair team initially planned to limit the cutting of the tanks to its metal vessel structure, which is not in contact with propellant. It could make it possible to extend the flexible internal bladder of the bellows to its full length. With the bellows in its unfurled position, the repair team hoped to be able to thoroughly wash the contaminating metallic dust off its internal cavity. If the plan worked, there would be no need to cut the flexible membrane of the bellows, containing the propellant, or the bulkhead of the tank, which holds it. As a result, it would be possible to conduct the thorough washing of the bellows without breaching the structural integrity of the hermetically sealed propellant-containing vessel. Of course, in the complex and interdependent world of space technology, nobody could tell at the time how long would it take to repair all six tanks, re-assemble the MLM module once again or when it could launch, but it was safe to speculate that at least a year would have to be added to the regular schedule. In the meantime, the problems plaguing the MLM also blocked the path to orbit for the long-completed Prichal Node Module, UM, (prichal is Russian for "pier") and for the new-generation Science and Power Module, NEM. Not to mention, the ISS itself was not getting younger with its retirement projected between 2024 and 2028. To make sure that the contaminated tanks for the MLM module were worth repairing, Roskosmos wanted to confirm that they had remained structurally viable after sitting on the exterior of the MLM Nauka module for nearly two decades. On March 23, 2017, Roskosmos ordered an inspection of the aluminum structures of the tanks by OAO Komposit, the space industry's key expert center in material science. The specialists did find a number of spots with early signs of corrosion on the bulkheads and stringers of the tanks not covered with the special protective enamel which gives the rest of the module its characteristic black color. In the meantime, the documented history of the climate control inside the GKNPTs Khrunichev's main assembly hall, where MLM had been stored during much of this time, showed a few rare instances of humidity exceeding the allowable limit of 80 percent, which could cause corrosion. OAO Komposit recommended to shave all the corroded spots off, while monitoring the thickness of the tanks' walls in the affected areas. According to industry sources, it could be necessary to conduct a structural strength analysis of the repaired bulkheads and stringers, taking into account the inevitable thinning of the material. By mid-April, the MLM project managers at GKNPTs Khrunichev prepared a new repair schedule, which aimed to complete the washing of the contaminated tanks in August. However, experts working on the repairs said that in addition to cuts of the tanks along their longitudinal axis, another opening would have to be made on its bulkhead, which holds the bellows, in order to get access to its internal cavity. In parallel with the work on the tanks, specialists will proceed with the assembly of the propulsion system, which includes newly manufactured components, experts said. 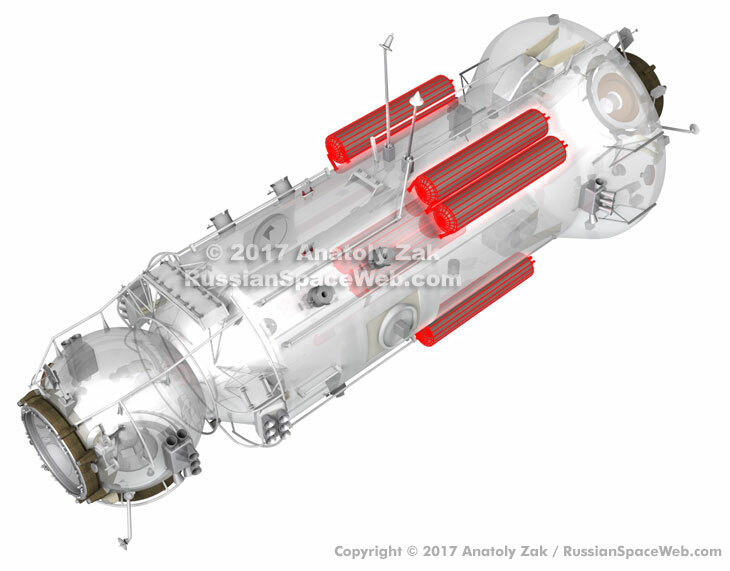 By middle of May 2017, Russian space officials penciled the new launch date for the long-delayed Nauka, MLM, module for October 2018. To account for the latest postponement in the MLM launch, planners began changing comings and goings of transport ships at the Russian segment of the International Space Station, ISS. 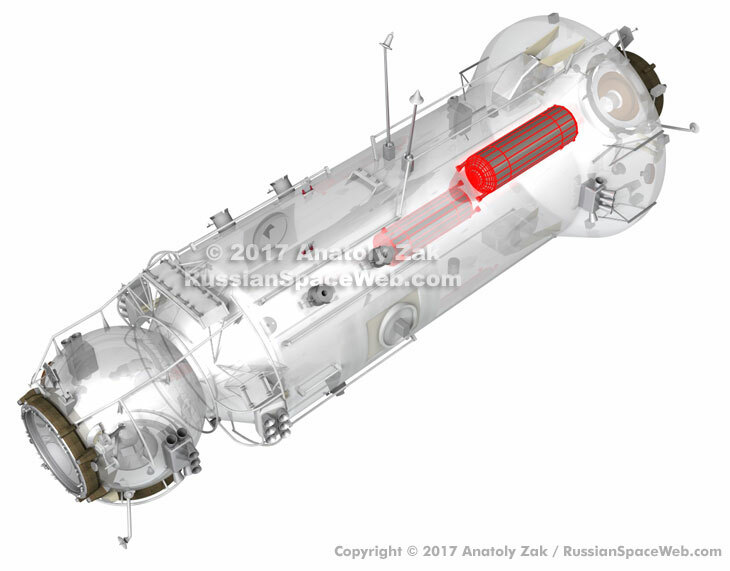 The upcoming docking of the Progress MS-06 cargo ship (Mission 67P in the ISS flight manifest) was moved from the Pirs Docking Compartment, SO1, to the aft port of the Zvezda Service Module, SM. According to previous plans, Progress MS-06 was supposed to take with it and discard the Pirs Docking Compartment, SO1, during its departure in December 2017, to make room for the arriving Nauka. In turn, the Progress MS-05 freighter (ISS mission 66P), which docked at the Pirs Docking Compartment on February 24, will now remain berthed at that port until September 2017. Previously, the spacecraft was scheduled to depart around June 14 to make room for Progress MS-06. On Sept. 8, 2017, Roskosmos State Corporation requested GKNPTs Khrunichev to complete a catalog of all the systems, components and instruments aboard the MLM Nauka module by September 30 of the same year. By the middle of September, RKK Energia prepared a new schedule for the pre-launch processing of the MLM, which was coordinated with all the sub-contractors involved in the project. It called for the shipment of the module to the technical complex at Site 254 in Baikonur Cosmodrome in May 2018, which would allow its launch in February 2019. 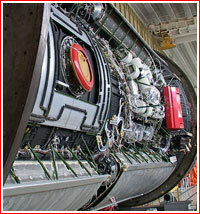 However, the latest problems with tank repairs at GKNPTs Khrunichev prevented the immediate approval of that schedule. Roskosmos directed Khrunichev to first complete its timeline for the company's remaining work with MLM by September 22. Still, RKK Energia proposed to use February 2019 as a reference date for planning future operations aboard the ISS. RKK Energia also proposed Roskosmos to issue a new amendment to the development contract awarded to the company in 2015 to reflect the latest status of the MLM project. Key changes pertained to a new timeline for integration of the MLM into the Russian Segment of the ISS. For example, Phase 4.3 of the contract would now be completed in September 2019 and Phase 5.1 would have a new completion date of December 2019. In the meantime, RKK Energia worked to address all the issues with the MLM module stemming from the latest delays. First of all, the compnay's officials issued an affidavit extending the operational warranty of the spacecraft until 2027. 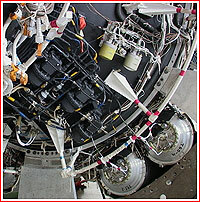 Engineers also wanted to ensure that the module's engines and the solar panel rotation mechanism, SOSB, would perform as planned in 2019, because both would be absolutely critical for the initial phase of the MLM mission, when the spacecraft separates from the third stage of the Proton rocket in its initial orbit and begins its autonomous flight to the ISS. The engines would be responsible for the rendezvous maneuvers, while SOSB will point a pair of solar panels toward the Sun to ensure that the module has a reliable power supply before it reaches the station. In the SOSB system there was an issue with the B14 component supplied by VNIIEM corporation in Moscow, while the 11D442 engines built at KB Khimmash in Voronezh were certified to work only until the end of 2018. The status of the MLM assembly was discussed at RKK Energia by its managers with their colleagues from GKNPTs Khrunichev on September 19. The meeting was chaired by First Deputy Director General at Roskosmos Aleksandr Ivanov who requested Khrunichev officials to prepare the company's latest plan for the work on the module by September 22. Based on the tank repair timeline developed by GKNPTs Khrunichev, RKK Energia worked out the integrated schedule for the launch of the MLM module in March 2019. The new schedule was reviewed at the Scientific and Technical Council, NTS, at RKK Energia on Oct. 20, 2017. 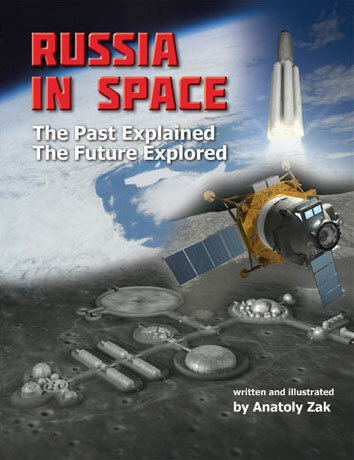 The NTS recommended Roskosmos to set the launch for March 2019, however due to numerous delays with the MLM spacecraft, the formal approval of the severely changed schedule had to be escalated to the Russian government. In the meantime, GKNPTs Khrunichev reported that its engineers had successfully completed testing of the tank cleansing procedures and immediately begun operations with flight-worthy tanks. The company set up a three-shift, seven-days-a-week work schedule with the MLM module in an effort to complete all the repairs on time. Fortunately, the previously seen leak in the test tank was narrowed down to an interface between the tanks' bellows and a support structure and it was not affecting the repaired hardware. On November 2, Director General of RKK Energia Vladimir Solntsev met with the Head of Roskosmos Igor Komarov, who insisted on launching the MLM module before the end of 2018, probably due to political pressure from the Kremlin. To accommodate this requirement, RKK Energia drafted a new timeline, which was approved by the company's leadership on November 3. The new schedule set the launch of the MLM module for Dec. 20, 2018, followed by its docking at the Russian Segment of the station on Dec. 29, 2018. According to the latest timeline, the arrival of the module will take place during Expedition 58, which will begin onboard the ISS at the end of October 2018. Shortly after the launch of the MLM module, the Pirs Docking Compartment, SO1, will be undocked from the nadir (Earth-facing) port of the Zvezda Service Module, SM, to make room for the new arrival. The discarding of Pirs will now be delegated to the Progress MS-09 spacecraft, which is scheduled for launch on June 13, 2018. Progress MS-09 will tug Pirs away from the station and then direct it into the Earth's atmosphere to burn up over the ocean. In order to leave Earth before the end of 2018, the MLM Nauka module would have to be shipped to the launch site in Baikonur in March. In case the processing team in Baikonur worked around the clock, the spacecraft could be ready for launch in seven months, leaving up to two months in reserve. However, experts familiar with the matter saw even the March 2019 launch date as overly ambitious and estimated that it would be more realistic to plan the launch around May 2019. The situation is complicated by the fact that in October, Aleksei Strelnikov, the Director of Human Space Projects Department at Roskosmos, warned that RKK Energia would have only one chance to push the schedule beyond the previously approved launch date in June 2018, before heavy fines would kick in against the company. On November 8, RKK Energia officially informed Roskosmos that the company had committed to the launch of the MLM Nauka module on Dec. 20, 2018. On December 11, the State Commission overseeing preparations for the launch of the MLM Nauka module formally approved the processing schedule culminating with the liftoff of the long-delayed spacecraft on Dec. 20, 2018. In the first half of December, Russian specialists and their European colleagues had already begun work on preparing some critical components of the MLM module for shipment to the launch site ahead of the spacecraft itself. During this and the coming week, Dutch specialists working on the European Robotic Arm, ERA, designed to be attached to the exterior of the MLM module, are expected to complete the final checks of the flight hardware at RKK Energia's facility in Korolev, near Moscow, and pack it for shipment to the Baikonur Cosmodrome. The components of the ERA manipulator are expected to be among several pieces of hardware for the MLM module that are scheduled to make a train ride to Baikonur as early as February 2018. According to industry sources, the MLM team will have a reasonable chance to meet the December 2018 launch window if it is able to ship the Nauka module to Baikonur in March. The pre-launch processing of the spacecraft in Baikonur will require at least seven months, leaving a few weeks in reserve to close any unexpected issues. However, this schedule still depends on the successful completion of the tank repairs, which are reportedly still ongoing. *Emergency deorbiting of the module would require additional 654.2 kilograms of propellant and it would be possible either without an initial maneuver of orbital insertion or before the second docking attempt.